The internet is full of animals doing cute things, cats riding turtles, pandas sneezing, baby sloths taking baths. But this is disposable cuteness confined within seconds and adrift in endless content that we can like without having to own that we like it. The heavy concrete cute of the lawn animals captured by ‘Westographer’ Warren Kirk are something else entirely. These are whims made in to solidified mass, they are owned. They represent their addresses with a disconcerting candour- the person who lives here chose swans. Individualized sincerity has been out of vogue for awhile, if it was ever in at all. The fixed nature of sincerity doesn’t suit our ‘keep up culture’ of compressed tastes and informed choices, appropriate down to the millisecond and discarded the moment they become passé. Walking around my inner eastern suburb the current choice is white tea-roses hemmed in by neat squat box hedges tucked behind cream picket fences. If you are edgier you might have uniformly planted agaves. Drought consciousness can be expressed with a neat border of mid-sized white river pebbles. The zen ball water features are very much over and flowers unfashionable since the 70’s that are still thriving a few more suburbs out have long since been killed off. 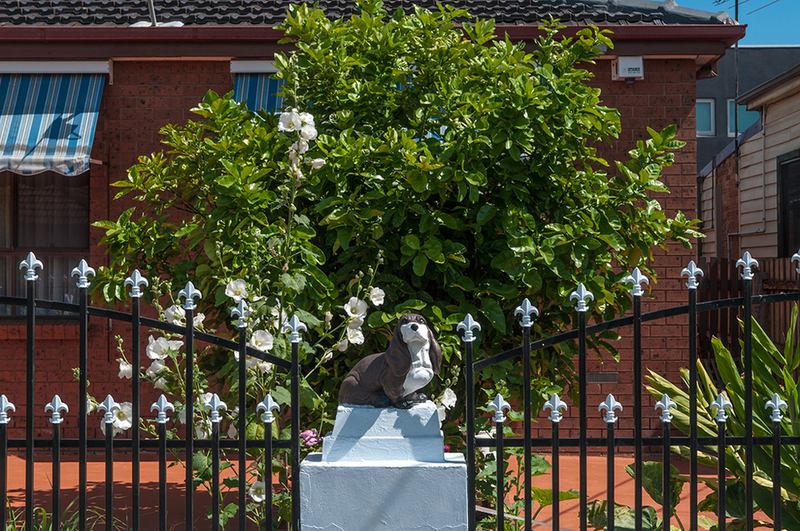 In contrast these westie animal lawn figures at some point became emblematic of an inability or refusal to upgrade or refashion to the prevailing homogeneous on-trend taste. And to me these white swans, red lions and even the daschund seem less naïve than those white tea-roses. They may represent their address with a fixed and unfashionable sentimentality but they seem to exist more. These concrete mascots are really at home. As Warren Kirk shoots and shoots Melbourne’s western suburbs his Westographer work forms in to loose and low-key typologies. Concrete lawn animals, vintage cars parked in front of houses of matching eras, distinct periods of acquirement followed by stasis, the clumsy signage of small home businesses, topiary, cars cloaked in silvery covers, people posing at their fences and in their kitchens, dated yet carefully maintained interiors, boarded up shops and faded hand-painted signs. This is not a taxonomy of nostalgia so much as time travel at normal pace; the new evolved to vintage in-situ. There is an occasional sense of world-weariness to this but mostly a sense of smart upkeep and good-as-new mindset. Warren’s straight-forward photographic style of direct framing under sharp filterless daylight perfectly suits the 'lived-in' spaces he captures. Historically unfashionable, the western suburbs have developed time-warp vectors and Warren clearly relishes these not because they were but because they are. The attitudes and circumstances behind the ongoing presence of the past is what his pictures really represent. Warren Kirk's Westography can be further explored on his flickr page. Text above by Amy Marjoram, editor of Excerpt Magazine.